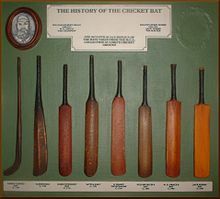 Historically, cricket's origins are uncertain and the earliest definite reference is in south-east England in the middle of the 16th century. 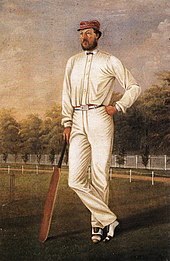 It spread globally with the expansion of the British Empire, leading to the first international matches in the second half of the 19th century. The game's governing body is the International Cricket Council (ICC), which has over 100 members, twelve of which are full members who play Test matches. The game's rules are held in a code called the Laws of Cricket which is owned and maintained by Marylebone Cricket Club (MCC) in London. The sport is followed primarily in the Indian subcontinent, Australasia, the United Kingdom, Ireland, southern Africa and the West Indies, its globalisation occurring during the expansion of the British Empire and remaining popular into the 21st century. Women's cricket, which is organised and played separately, has also achieved international standard. 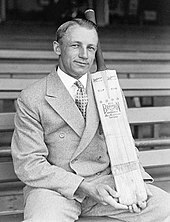 The most successful side playing international cricket is Australia, having won seven One Day International trophies, including five World Cups, more than any other country and having been the top-rated Test side more than any other country. In the photo, the two batsmen (3 & 8; wearing yellow) have taken position at each end of the pitch (6). 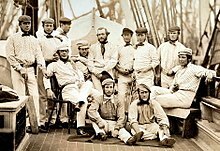 Three members of the fielding team (4, 10 & 11; wearing dark blue) are in shot. 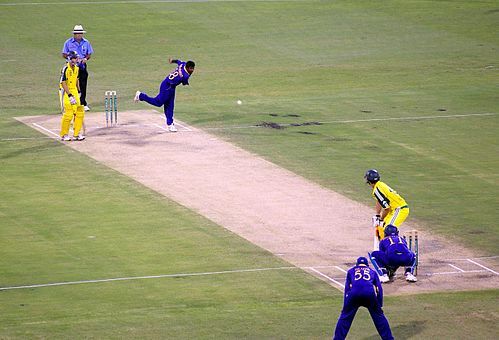 One of the two umpires (1; wearing white hat) is stationed behind the wicket (2) at the bowler's (4) end of the pitch. The bowler (4) is bowling the ball (5) from his end of the pitch to the batsman (8) at the other end who is called the "striker". The other batsman (3) at the bowling end is called the "non-striker". The wicket-keeper (10), who is a specialist, is positioned behind the striker's wicket (9) and behind him stands one of the fielders in a position called " first slip" (11). 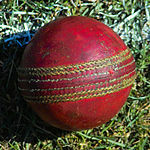 While the bowler and the first slip are wearing conventional kit only, the two batsmen and the wicket-keeper are wearing protective gear including safety helmets, padded gloves and leg guards (pads). 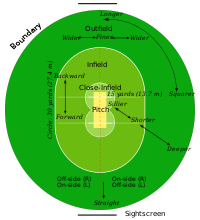 While the umpire (1) in shot stands at the bowler's end of the pitch, his colleague stands in the outfield, usually in or near the fielding position called " square leg", so that he is in line with the popping crease (7) at the striker's end of the pitch. 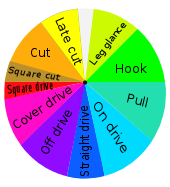 The bowling crease (not numbered) is the one on which the wicket is located between the return creases (12). The bowler (4) intends to hit the wicket (9) with the ball (5) or, at least, to prevent the striker (8) from scoring runs. 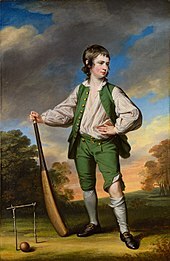 The striker (8) intends, by using his bat, to defend his wicket and, if possible, to hit the ball away from the pitch in order to score runs. The innings (ending with 's' in both singular and plural form) is the term used for each phase of play during a match. Depending on the type of match being played, each team has either one or two innings. Sometimes all eleven members of the batting side take a turn to bat but, for various reasons, an innings can end before they have all done so. 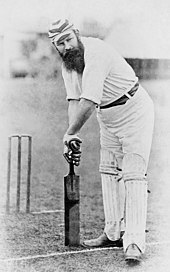 The innings terminates if the batting team is "all out", a term defined by the Laws: "at the fall of a wicket or the retirement of a batsman, further balls remain to be bowled but no further batsman is available to come in". In this situation, one of the batsman has not been dismissed and is termed not out; this is because he has no partners left and there must always be two active batsmen while the innings is in progress. 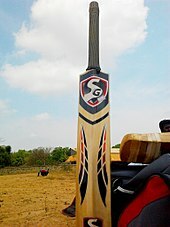 The International Cricket Council (ICC), which has its headquarters in Dubai, is the global governing body of cricket. 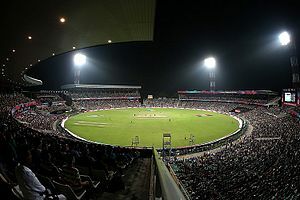 It was founded as the Imperial Cricket Conference in 1909 by representatives from England, Australia and South Africa, renamed the International Cricket Conference in 1965, and took up its current name in 1989. The ICC in 2017 has 105 member nations, twelve of which hold full membership and can play Test cricket. The ICC is responsible for the organisation and governance of cricket's major international tournaments, notably the men's and women's versions of the Cricket World Cup. It also appoints the umpires and referees that officiate at all sanctioned Test matches, Limited Overs Internationals and Twenty20 Internationals. 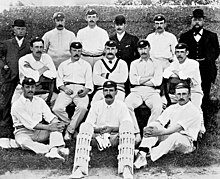 Australia established its national first-class championship in 1892–93 when the Sheffield Shield was introduced. In Australia, the first-class teams represent the various states. New South Wales has the highest number of titles.